My cousin-in-law made the most gorgeous baby gifts for Felix & I have to share them with you. Natalie has been knitting for ever & we’ve been the lucky recipients of her handiwork in the past. 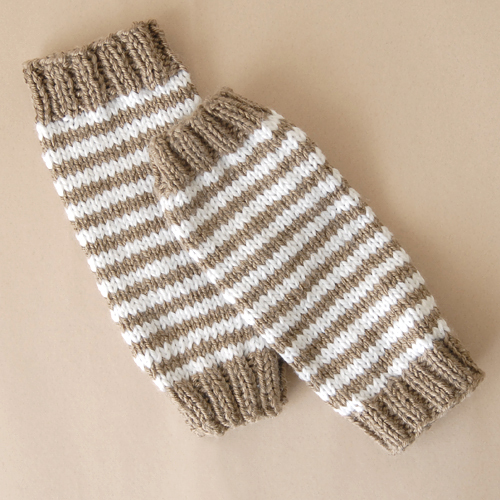 She made these sweet little striped legwarmers. Stripes are so adorable. Perfect for a man child. I’m completely in love with this sweater & I can’t wait until Felix can fit into it! The orange & grey color scheme melts my heart. A hoodie?! How could it get better? After we opened these gifts, Penelope quickly snatched this hoodie, tore off her clothes & put this sucker on. She wouldn’t take it off for about two days! Isn’t his smile just precious?! And this baby blanket is la piece de resistance! OH gosh, it’s awesome. 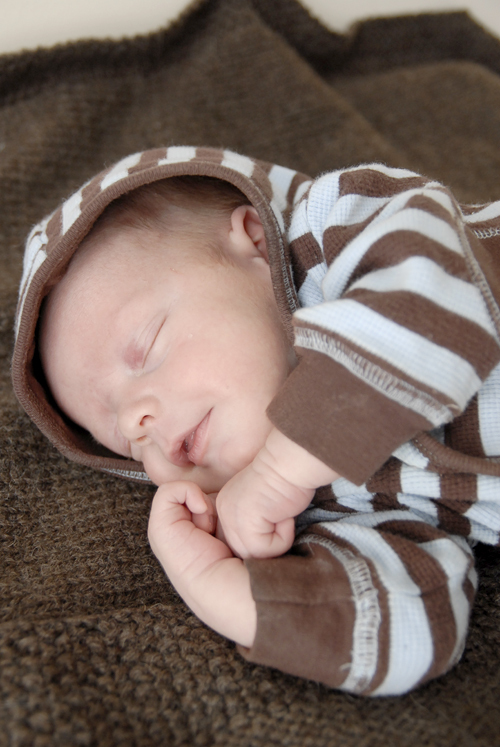 It’s soft, wool, stretchy & perfect for a little cuddle session with my man child. Best. Blanket. EVER. I can’t imagine all the time Natalie spent on making such beautiful things & I’m just blown away at her kindness & thoughtfulness. Every time Felix uses/wears these treasures we’ll always think of her. Thanks, Natalie! We love you! EDIT: Natalie just posted this, for any of you who would like more info on the patterns & yarn she used – For anyone interested in the patterns I used I got the 2 sweaters and blanket off of Ravelry. I have a username: nannersboo. I don’t ever upload pictures, but I include the yarns I used. 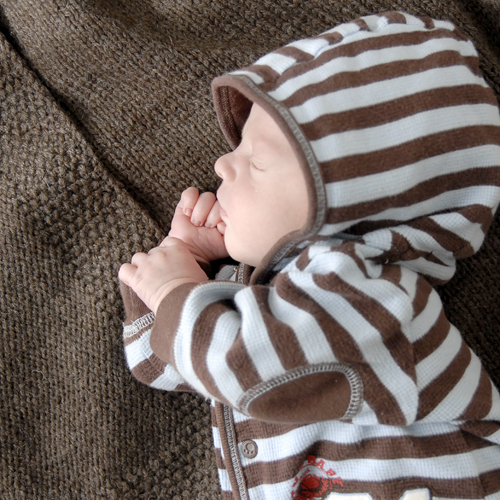 The pattern for the gray sweater is called Organic Guernsey by Fawn Pea, the hoodie (also available through the Bernat website) is called Lil’ Bear Hoodie and leggings, and the blanket is called NuckNuck and is by Gina Bonomo. So cute! It’s hilarious that you call him man child. Love the hoodie and blanket. That handiwork is impressive. So darling, so well done. Applause, applause!!! Your cousin completely rocks. I am so jealous! WOW your cousin is really talented. LOVE that grey and orange sweater and the brown blanket. Love the presents, your cousin has excellent taste and skill. It’s so hard to find fun boy things to knit. (My two oldest are boys, believe me I know!) Does your cousin have a Ravelry name? I’d love to see the details on her blanket. Love seeing pictures of your little guy. Wow what a beautiful baby. 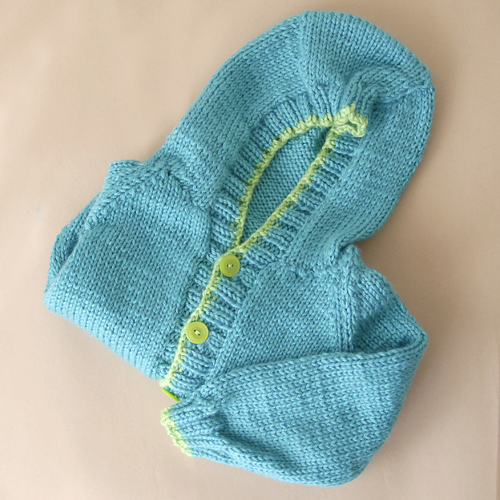 Oh, and the knits are just gorgeous as well. :) Congratulations on your new addition. Oh Melissa! I missed the birth of baby Felix! I just wanted you to know I am so happy for you! He is a little doll, and you look great too! Now you have your waist back, and I’m losing mine! Ha ha. Oh, and the name Felix is seriously a gem. I love it. I do agree Natalie did a great job making them! But I have to say felix is just so adorable. I am having felix withdrawls! I hope to come by and visit soon!! For anyone interested in the patterns I used I got the 2 sweaters and blanket off of Ravelry. I have a username: nannersboo. I don’t ever upload pictures, but I include the yarns I used. 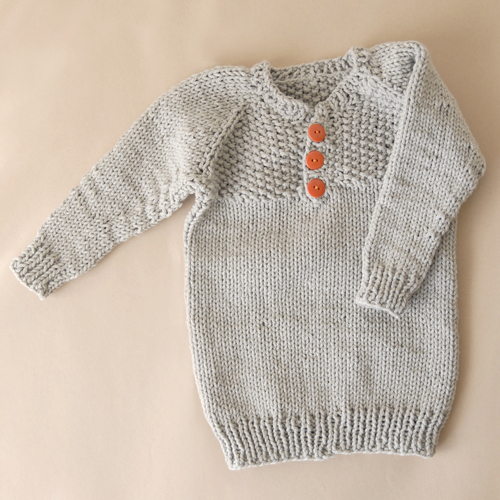 The pattern for the gray sweater is called Organic Guernsey by Fawn Pea, the hoodie (also available through the Bernat website) is called Lil’ Bear Hoodie and leggings, and the blanket is called NuckNuck and is by Gina Bonomo. You are lucky. Everything is so very lovely. Although I suppose that’s not the correct term for a boy’s clothing…Felix is adorable!